A bill of lading is perhaps the single most important document for a trucking company. Not only is it legally required, but it must be fully completed before a freight shipment can even get underway. If one is filled out incorrectly from the outset, it could delay a shipment and cost the company quite a bit of money. To ensure that this does not happen, consider the following easy guide to the completing bill of lading forms. A trucking bill of lading form serves three main functions. The first of these is to act as a receipt of goods. 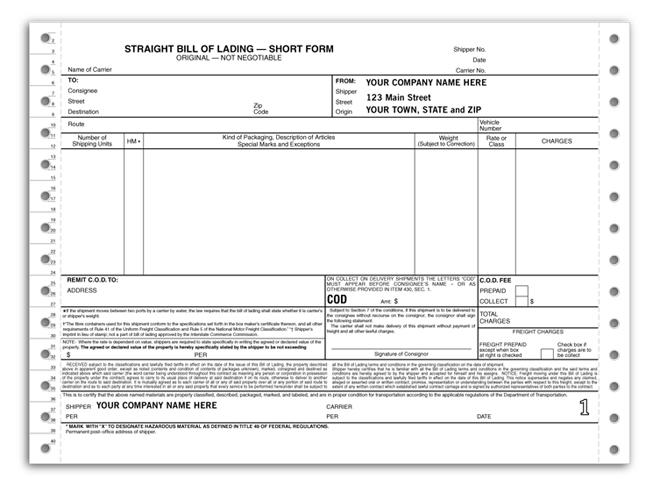 The bill of lading is first issued by the carrier and given to the shipper. This is done in exchange for actually receiving the cargo. It also serves as evidence that the carrier has received the merchandise in good condition. The second important function is that the bill of lading is intended to be evidence of a contract existing between the carrier and shipper. This allows the cargo to be shipped as originally agreed upon. Finally, the bill of lading is also meant to be the document that confirms the title to the goods. Straight Bill of Lading – This is a non-negotiable type of form that is used when the goods have either already been paid for, or no payment is actually required. Order Bill of Lading – This is issued to the shipper, but can be transferred to a third party if properly endorsed. Negotiable Bill of Lading – This can be transferred to a third party upon being endorsed and delivered to another consignee. Claused Bill of Lading – If there is any damage at all to the goods that have been delivered, this type of bill lading becomes necessary. Electronic Bill of Lading – As its name implies, this is a form of bill of lading that is entirely paperless. Understanding the need for a bill of lading will help your trucking business conform to existing regulations. This will make you more profitable in the long run, all the while streamlining your operations.